When I first heard of The Detachment Kit it was right after the release of their album They Raging. Quiet Army, which drew comparisons to such bands as Les Savy Fav, The Pixies and The Dismemberment Plan. 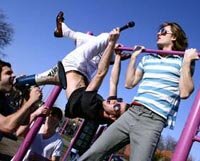 As luck would have it, they ended up on Les Savy Fav's label French Kiss Records for the release of their second album, Of This Blood. That was about 2 years ago, so I recently did some checking to see what they're currently up to and found some interesting new demos up on their website. The song "Mr. Dash Dash" in particular really grabbed me, it has a Beatle-esque quality to it, and reminds me of a slightly more angular Spoon. Now I'm hyped to hear a new album from these guys, hopefully we'll get more details soon.